The Rochester Knighthawks professional lacrosse team honored the last surviving Akwesasne World War II code talker, Louis Levi Oakes, 92, Kanien’keha:ka (Mohawk) in front of a crowd of 6,000 Saturday night at the Blue Cross Arena in Rochester, NY. Levi Oakes stands at center field with his great grandchildren (left to right) Warren, (Levi Oakes) Ryan and Ronin Oakes. 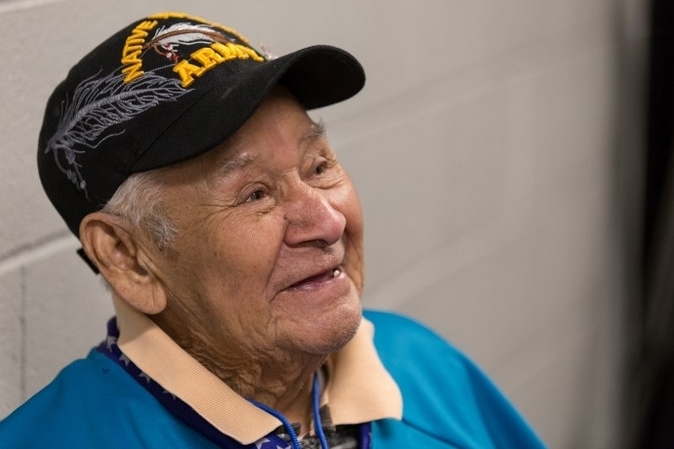 After the war, Oakes worked for 30 years as an ironworker in Buffalo, NY and later worked in the highway department at the Mohawk territory in Akwesasne, New York before retiring. 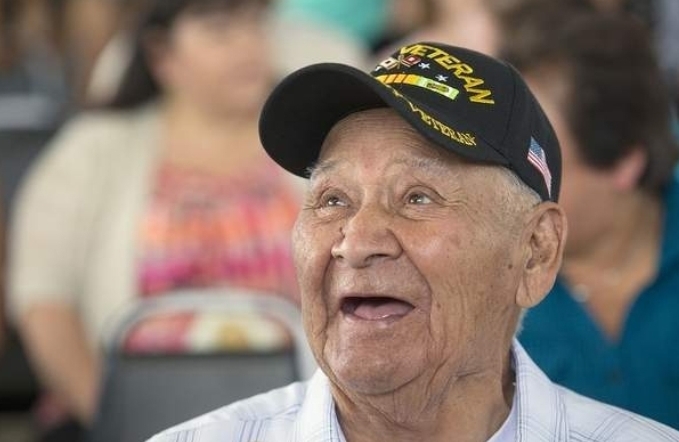 During WWII, the Mohawk language was one of several Native languages used to send communications between U.S. forces. 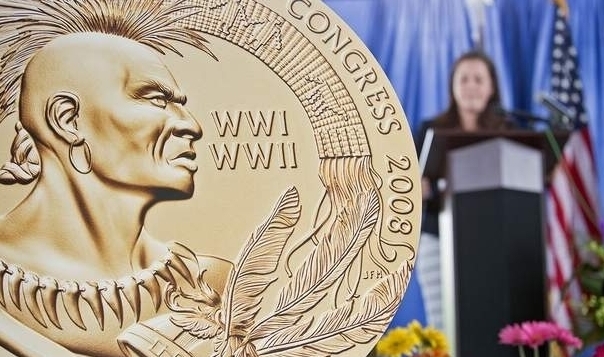 The Native American code talkers are world known to have to only unbroken military code in history and these messages in WWII were never interpreted by the Japanese. 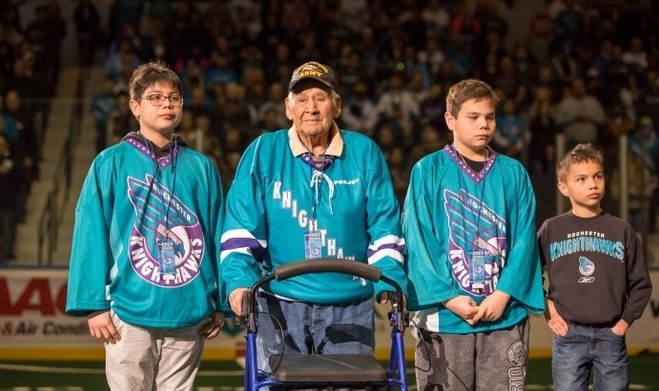 At the Knighthawks game, Oakes’ daughter Dora Oakes told Indian Country Today that her father never talked about his service and it was only a few years ago, when their local American Legion started to ask about his service, that she found out the contribution her father and other Mohawks made as code talkers. With the help of his great grandchildren, Oakes made his way to the center of the arena where the crowd gave a thunderous cheer and applause. 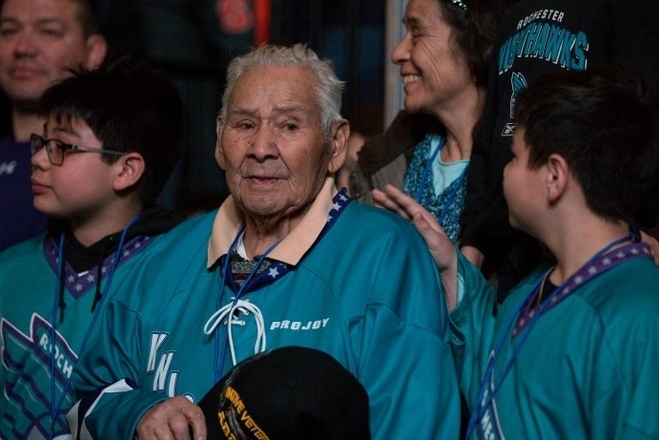 Oakes was gifted a traditional wooden lacrosse stick before he dropped the ball in a ceremonial faceoff to start the game. 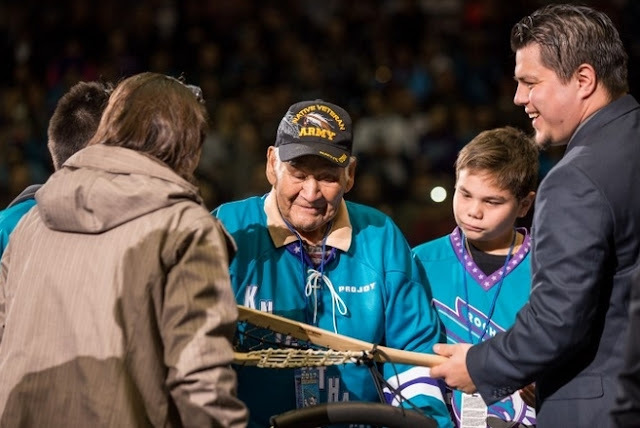 Levi Oakes was presented with a traditional lacrosse stick in honor of his Iroquoian Mohawk heritage. Responses to "Last Living Mohawk Code Talker Honored in Front of a Crowd of 6,000"